Members of the Daigle family put some energy into a Cajun dance class at the Daigle family reunion, part of Congres mondial acadien at Mount Saint Vincent University in Halifax on Sunday. 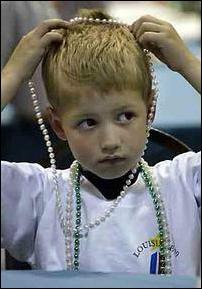 Matthew Deagle, 6, of Dominion pulls Mardi Gras beads over his head while listening to door prizes being announced at the Daigle family reunion. Deagle is an anglicized form of Daigle. A cooking lesson doubled as a history lesson at the Daigle family reunion in Halifax on Sunday. "When you begin a gumbo, you start with very, very hot grease," guest speaker Carol Templet Aucoin of Belle River, La., told Daigles from around North America gathered in a hall at Mount Saint Vincent University. The reunion was one of almost 100 being held as part of Congres mondial acadien 2004. Slipping from French to English, Ms. Aucoin became emotional as she described how to make roux, the vital thickening agent in gumbo, by adding flour to that scalding grease. "I think of the pot that I have to make the roux (in) as the deportation, the pain, the suffering, the death . . . all of the misery that our ancestors must have gone through," she said. But then she adds file (pronounced fy-lee), ground sassafras leaves native to the southern United States, as a second thickening agent. The file settles the mixture - to which one might later add chicken, shrimp, crawfish or sausage - just as Louisiana became a settling place for the banished Acadians. "After we got through all the horrors of the deportation, there's something good that came out of it," Ms. Aucoin said. The language, strong family ties and music of the Acadian people are like the onions, garlic, tomatoes and other ingredients that add flavour to the gumbo, she said. There was plenty of that spice among the Daigles on Sunday. From 200 to 250 turned out for a day that included a mass, food, crafts, genealogy and plenty of dancing. Florence Daigle Perkins of Baton Rouge, La., secretary of the Association de la Famille Daigle, said the event has been in the works for more than a year with much of the planning happening by e-mail across the continent. She said there are relatively few Daigles in Nova Scotia, with the majority, about 40 families, living in Halifax Regional Municipality. In addition to strong contingents from New Brunswick and Louisiana, Daigles came to Halifax from places like Maine, Massachusetts, Illinois, Michigan and Ontario. Allison Daigle grew up around London, Ont., but said most of her relatives are in New Brunswick. She recently moved to Halifax after studying at Acadia University in Wolfville and came out Sunday to represent her branch of the family and learn something about her roots. "When I was growing up, my father only knew (his lineage) as far as his grandparents," she said. "And then we had somebody contact us and they had our genealogy done back to 1643 when they left France. "It's interesting to all of a sudden have a history." One special guest Sunday was not a Daigle, nor even an Acadian. Ten years ago, Marie-Josee Rosconi and her husband Mark Robertson bought property on what they knew to be Acadian land in Carleton Corner near Bridgetown. After a chance encounter with Nolan and Deeda Daigle of Louisiana two years ago, they realized their home sat on part of the homestead of Olivier Daigle (or Daigre), the first Daigle to settle in Acadia. Ms. Rosconi said she kept in contact with the Daigles and, knowing the Congres was coming up, helped organize a picnic on the property. That happened last Sunday. Next week she'll welcome members of the Prince family whose ancestor Jean Le Prince married the widow of Olivier Daigle's son. "Little did I know 10 years ago when I bought that land that it would have been so rich in history," she said. Ms. Rosconi, who stressed she is not a historian, was invited to speak at Sunday's reunion about the property and artifacts dating back to Olivier Daigle's time that her husband has unearthed on the property. "It's not even my history, but it's fascinating," she said. "It gives you a sense of belonging. Now I feel that I am a part of them."